Bass Guitar Lessons in Manchester - Trusted Quality Tutors. Do you want to learn bass guitar? Thinking of taking bass guitar lessons in Manchester? With Music Tutors, you can learn to play like awesome bassists Flea and Victor Wooten with bass guitar lessons in Manchester from a high-quality professional music tutor. Get in touch with one of our great bass guitar tutors and you could start seeing rapid progress today! It doesn’t matter if you’ve just picked up the instrument for the first time or already have playing experience, we can match you with a tutor who can give bass guitar lessons in Manchester tailored to you! Get in touch today for 50% off the first of your bass guitar lessons in Manchester! At MusicTutors.co.uk we understand that life can get crazy. That's why our range of amazing tutors offer the option to give bass guitar lessons in Manchester at your own house! Speak to one of our great bass guitar tutors today to organise bass guitar lessons at a time and place that works around your busy schedule. Try the first of your bass guitar lessons in Manchester for half price! Do I Need My Own Bass for Bass Guitar Lessons in Manchester? It's always a good idea to have your own bass guitar and amp so you can get practising between lessons. Your new bass guitar teacher will be able to advise you on what bass guitar to buy, and the best way to make sure bass guitar is the instrument for you and your bass guitar lessons in Manchester! Have a read below of what our MusicTutors team has to say about taking bass guitar lessons, and for more information click here. Finding safety-assured bass guitar lessons in Manchester can be tricky. At MusicTutors, we are committed to bringing regulation into private music tuition. All of our tutors have been through a recruitment process to ensure the quality of musicianship as well as teaching ability. Additionally, all of our bass guitar tutors must hold the Enhanced DBS Certificate before they can teach with us, building a community of trust between students, teachers, and parents. You can rest easy knowing that your bass guitar lessons in Manchester are as safe as they can be! See our Manchester guitar tutors here! See our Manchester singing tutors here! See our Manchester drum tutors here! See our Manchester piano tutors here! Not Sure About Bass Guitar Lessons in Manchester? "This is just an amazing company and run by some pretty awesome people. Connecting students with amazing tutors and musicians and helping people connect through the love of music. Music Tutors will influence the future of music education." As you’ve become inspired to take bass guitar lessons in Manchester, you may have seen people play the instrument in different ways. Traditionally, the bass guitar strings are plucked with two of your fingers. This method is taken from the bass guitar's older relative: the double bass. However, different methods of playing the instrument have developed since then too. You may have heard of 'slap bass', a technique that produces a deep percussive timbre which sounds amazing at high speeds. You might have also seen bassists using a pick, much like guitarists do. All three of these methods are valid ways of playing. However, it all depends on the genre! Typically, you wouldn't use a pick in jazz playing, or slap bass in pop, but who's to say you can't mix it up! You can explore this with your teacher in your bass guitar lessons in Manchester. Buying Your First Bass for Bass Guitar Lessons in Manchester? When you’re buying your first bass guitar for bass guitar lessons, there are a couple of things that you need to know. Firstly there’s getting the right size instrument! Bass guitars come in a few different sizes: for the younger beginner bassist, we would recommend getting a ½ size or ¾ sized Bass guitar. Either will be fine to get you started, so pick the size that feels most comfortable for you. For those picking up the instrument at a later stage, you should buy a full- size bass. Most basses that you see in a music shop will be a full-size so they are easy to spot. Ask about this in your bass guitar lessons. For an all-inclusive beginner kit, you will be looking at a price between £120- £200. For just a beginner bass guitar on its own, you should look in the region of £100-£200 although there are some options for under £100. Finally, for just the bass amp on its own, you’ll be looking in the region of £150- £300. 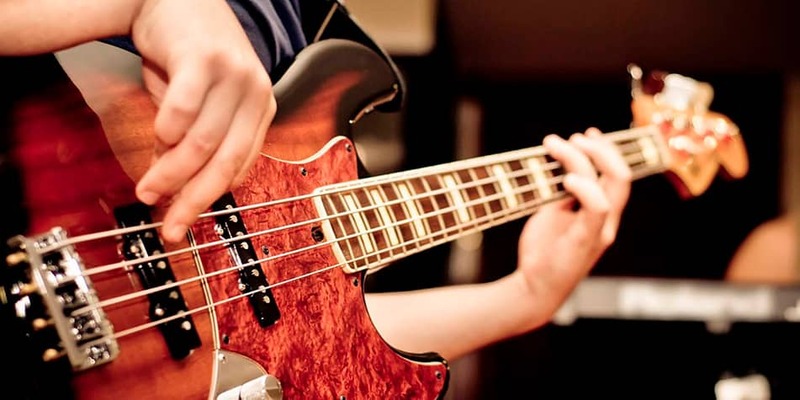 Presuming that you have decided to take bass guitar lessons in Manchester with an electric bass, it is likely that you will come across the terms 'Precision Bass' and 'Jazz Bass'. These are the two most well-known types of bass guitar produced by Fender. However, other companies also produce instruments based on these designs, sometimes calling them P style, or J body - so it is good to know the differences between the two. The precision bass has a similar body style to the Fender Stratocaster guitar. This bass has been very popular with rock, pop, punk and indie players. Famous players include Sting, Pino Palladino, Nate Mendel, and Mark Hoppus. The jazz bass has what we call an 'offset body'. This is more similar to the Fender Jazzmaster or Jaguar guitar. The shape was primarily designed for jazz players who performed sitting down. So it is worth trying this style of bass standing up, to check that it feels comfortable to you. It's also worth mentioning that the neck will feel a lot slimmer than the P bass. Of course, these are not the only two styles of bass that you can pick up. However, they are the most common and have been super influential on other bass designs. Other designs include a Sting-Ray from Ernie Ball, as well as bass designs based on famous guitars, including the SG Bass by Epiphone, and the Jazzmaster Bass, also by Fender. Your bass guitar teacher will cover this for you in your bass guitar lessons, but here's a bit of starter information to get you ahead of the game! The four strings of a bass guitar are the same as the bottom four strings of a guitar: from low to high E-A-D-G. However, the bass guitar strings are an octave (12 semi-tones) lower, producing a thick deep sound. Also, bass strings are very thick - a lot thicker than Guitar strings. This does mean that they are more expensive to buy, with an average set of strings costing around £20-£25. With this in mind, it's worth taking good care of them so that you don’t need to replace them as often. You can simply wipe them down with a dust cloth, removing any dirt that has got caught between the neck and the strings. This will keep the strings sounding fresh and help them last longer. It's also worth considering that the width of the strings makes them much more difficult to play than guitar, so it's likely you'll find it tough on your fingers in the beginning. Don’t be discouraged by this - everyone experiences this! Even your favourite virtuoso bass players will have had trouble to begin with. Instead of being afraid of this, accept the challenge! Play for a short amount of time each day - when your fingers start to hurt, take a break and come back to it. By playing for a short time each day, you'll soon build finger strength, and you won't find it tricky at all after a while! If you carry on with this positive mindset, you’ll find the learning process more enjoyable, plus you'll find you're making progress really quickly! When we first pick up the bass it can seem daunting: in front of us are what seems like hundreds of frets and an endless stream of notes. But hopefully, we can give you some pointers to get you started. Let’s take the bottom E string. When we play it on its own with no fingers on the fretboard, we call that playing an “open” string. Once we’re ready to play “fretted notes” (notes that sound by putting our left-hand fingers on the fretboard), we need to know which fret is which. This will seem very difficult at first, but it is just a matter of counting. Our “open” E string we number as Zero. The first fret is 1. From there, each fret is a new note that is one semi-tone away from the last. Just try playing each of the frets, from the first fret going up by one each time so that your hand is moving closer to you. Once you get to your 12th fret, you're back round to E. This principle also applies for the other three strings. Try practising getting familiar with this outside of your bass guitar lessons, to improve as quickly as possible! Tuning is another obstacle that guitarists and bassists need to learn in the early stages. In fact, we recommend that it is one of the first things you learn. To get you started, you can purchase a tuner which will tell you if the bass notes are sharp or flat. An alternative way is to tune to a Piano. To do this you would play the E-A-D-and G notes on a Piano and then compare the two notes. Spend some time trying to match the open string notes to the piano notes, turning the pegs only a tiny bit each time. This will be harder at the beginning because we are training our ears and trying to understand new and abstract concepts. But mastering this will improve your musical ear from the start. Your teacher can help you with this in your first bass guitar lessons in Manchester. Most bass parts consist of single notes. However, it is possible to play chords, but this technique is not common - the instrument already has a deep sound, so chords can sound too muddy and can be tricky to pair with other chordal instruments like guitar. However, chordal bass parts have been used in some great songs, and can sound really nice, especially in the bass' higher register. Play around with chords, single note parts and some different techniques - have a listen to the bass parts in your favourite songs, discover what you love to play, and take this to your bass guitar lessons! Playing with good timing is important for any musician, but it's especially important for bassists! Sometimes, this is something people realise after playing for a couple of years, and they have to jump back to basics to work on this. It's best to work on this from the very beginning, that way it's ingrained in your playing for life! We suggest buying a metronome! This is a device that clicks at an even pace, so each click can represent a beat in the bar. Start off with 4/4 - four beats in a bar. Let the metronome do the counting for you, and aim to play exactly on each click of the metronome. This is a difficult task, and not always the most exciting one, but don’t feel discouraged! Every musician has to learn to do this, and it's so worth the hard work! Having an excellent grasp on the fundamentals is what separates a good player from a great one. Something you can't explore fully within your bass guitar lessons is playing with a whole band of other people - this is definitely recommended though! And when taking bass guitar lessons in Manchester, there's really no excuse as there's so much to get involved in! In a pop and rock context, the bass takes on a unique role that almost has more in common with the drums than the guitar or vocals. Together, the bass and drums make the 'rhythm section', and they lead the band together. Often, the rhythms in the bass will be similar to the rhythms in the drums - this is called “locking in”. For example, you may play the same rhythm as the bass drum, or you might elaborate that with some of the rhythms from the snare or toms. Although a simple concept to understand, it is difficult to master playing perfectly in time with other insturments. But like everything - we get better with practise! Here’s what we suggest: make friends with a drummer and get together just the two of you - here, you can practise just playing at the exact same time as the bass drum. Once you have this down, you’ll find playing with a full band, where there are other rhythms and melodies going on, everything will sound tighter and more together. Here are three tips for maintaining and optimizing your bass. These are also things to look out for when buying a new/used bass. The neck of the bass should curve ever so slightly away from you when holding it in the playing position. It may look straight even though it is correctly set up. This can be adjusted with the truss rod which is a long metal rod positioned inside the neck which can be tightened or loosened in order to relieve tension on the neck. If the neck is too straight, the strings will buzz on the frets and the truss rod should, therefore, be tightened. Seek help from a professional if you do not have any experience in adjusting the neck on your bass. If you tighten or loosen the truss rod too much, it can break the neck. The distance between the fretboard and the strings (and therefore the amount of pressure required to make a clean sound) is described as the guitar's 'action'. Some players prefer a high action because of the sound it gives the instrument. For beginners, a lower action is recommended. Action can be altered by adjusting screws that determine the height of the strings on the bridge. When the strings are low but do not buzz against the fret, the set-up is correct. Manchester is a buzzing Northern metropolis that has given us some iconic bands and musicians. These include Oasis, Joy Division, The Smiths, The Stone Roses and many more! Music is at the heart of what makes Manchester great - if you asked anyone what Manchester is most famous for, you’d likely get one of two responses. Football, and Music! Manchester's lively, vibrant and diverse music scene is world class, and there are loads of great venues where you can experience it all first hand! This charming cosmopolitan city has venues of all sizes from small capacity clubs such as Gorilla and , to the massive Manchester Arena, Victoria Warehouse and the colossal Etihad Stadium. However, the eclectic music scene is not only for lovers of pop and indie music. Bridgewater Hall hosts hundreds of concerts for fans of Classical and Jazz. Especially for Jazz lovers, there’s the Manchester Jazz Festival, where you can see acts from the North of England as well as legendary artists. As one of the biggest cities in the UK, Manchester is also home to some fantastic higher education institutions such as The University of Manchester, Royal Northern College of Music, and BIMM. But why just watch it? Want to try being the one on the stage? There are plenty of groups that you can get involved within Greater Manchester! The Halle Choir is a prestigious choir that performs around 15 times a year. The Sunday Boys is a non-audition, all-male choir that meets weekly and also performs regularly. Each year, hundreds of people decide that they would like to learn a musical instrument. However, it's difficult to find that perfect instrument to get you started - there is a minefield of technical language to know and understand, plus trying to guarantee quality while sticking to a budget. Luckily, there are many friendly music stores in Manchester that can advise and steer you in the right direction. Forsyth has a stunning collection of pianos and sheet music, including beginner books. Both PMT and Dawsons have a fantastic selection of guitars, bass guitars and drum kits. At MusicTutors, we are always there to help connect students with their perfect tutor. If you have any questions about bass guitar lessons in Manchester, call us on 07946 125613 or get in touch by e-mail [email protected]. We look forward to hearing from you!